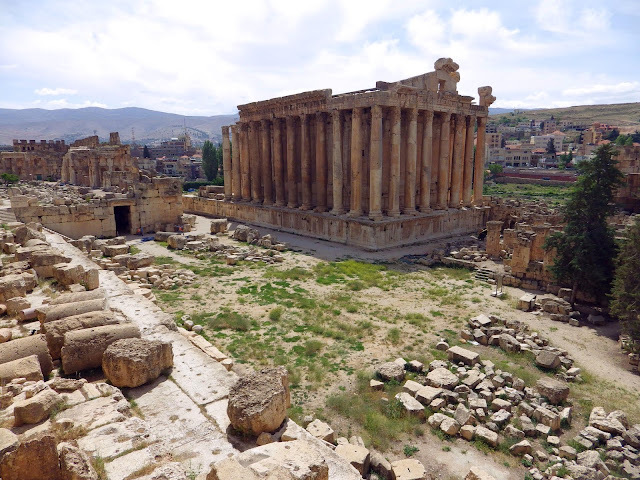 I had seen the ancient Roman temples of Baalbek in an old BBC documentary and have had it on my travel list for many years. Now seemed a good time to visit, I was in the region and the recent fighting close by in Syria, which had sent rockets crashing into the town, and incursions over the border, had quietened down considerably. 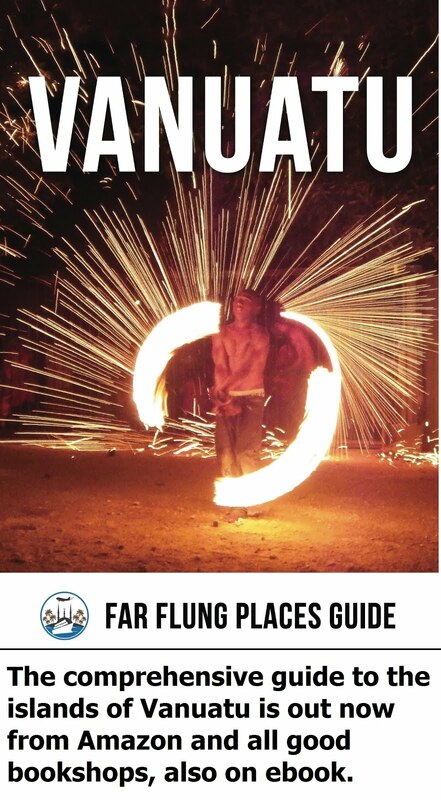 It was still listed as a place not to travel to by the Australian and British governments, amongst others (be aware of these warnings before you decide to travel, as they are put there for a reason, and do affect important things like travel insurance). Just after my visit, a town nearby, Qaa, was hit by a wave of deadly suicide bombings. 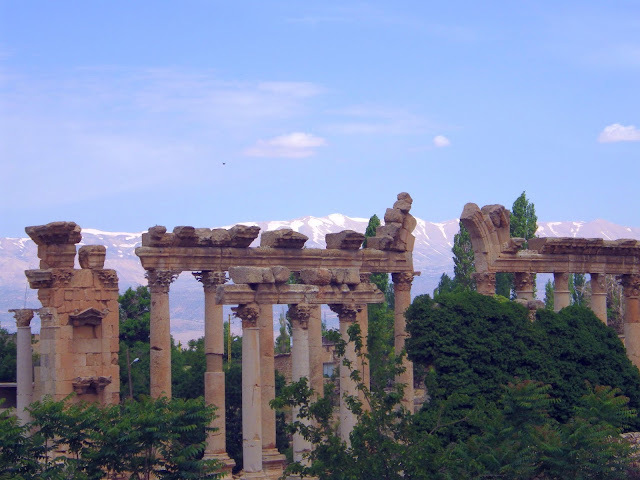 Is Baalbek worth travelling too? Absolutely, if you check the current security status, accept the risks, and can travel with locals who know the current situation and the best transport routes, it is a stunning place to visit. The sheer size of the Roman temples make this one of the most impressive ruins in the world. 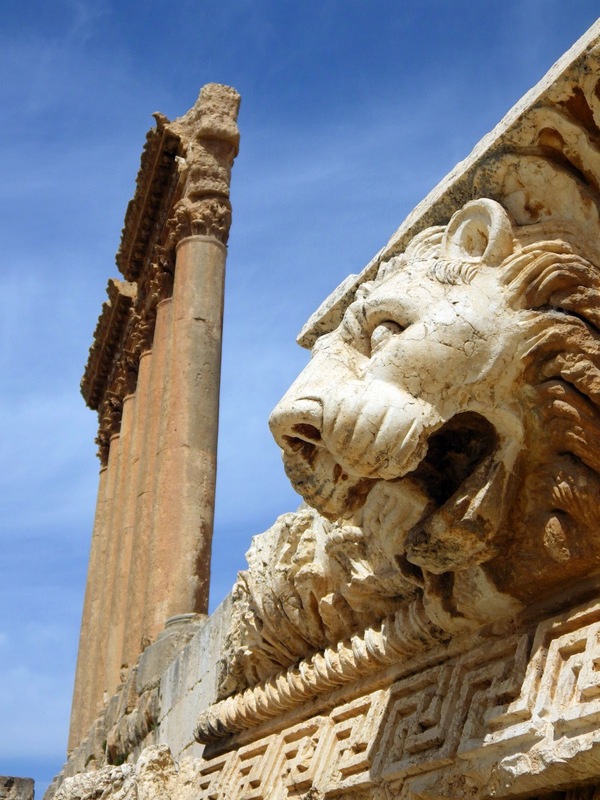 It's location, closer to Damascus than Beirut, makes it one of the least visited Roman sites in the world currently. Where once thousands thronged amongst the ruins I did not see another visitor the entire morning I was there, except for members of the Lebanese armed forces, who seemed to be mixing a bit of guard duty with ruin exploration. As I had only limited time in Lebanon I decided to blow the expense and a get a 4WD car. My driver Khaled drove me north toward Baalbek. Khaled was a 'fixer' more used to earning big bucks driving foreign tv crews around the country for news reports. With all the action over the border, few tv crews were visiting, except for ill-conceived tabloid program attempts at kidnapping children which he wisely refused to get involved in. In previous years, he told me, kidnapping was also the biggest risk to tourists here. 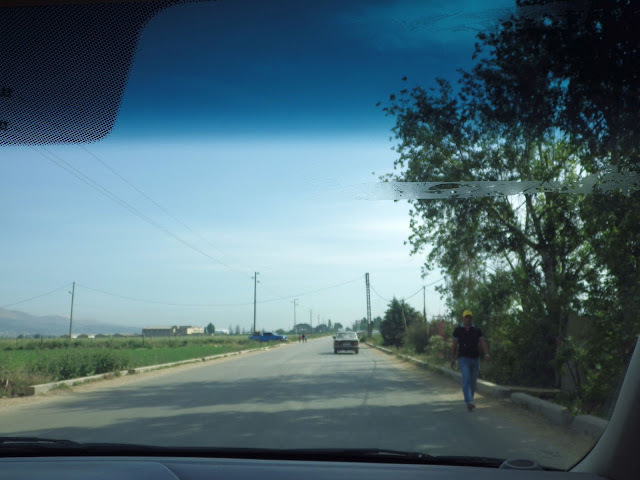 It was a bit of a national pastime in the Bekaa valley, with a European or American tourist earning the kidnappers the equivalent of ten years wages. He laughed as he pointed out that we were on the road (pictured below) where most kidnappings took place. "Do not worry. They will not stop you, you are not worth the time and effort, and the army would find you within hours and make their life hell. It is so much easier these days to kidnap Syrian refugees here. They arrive with all their money in suitcases, and they have gold bars." We passed many makeshift Syrian refugee camps as we continued on the road. I thought the poor bastards had been through more than enough problems in their home country without having to face losing what little they had left in their new temporary home. 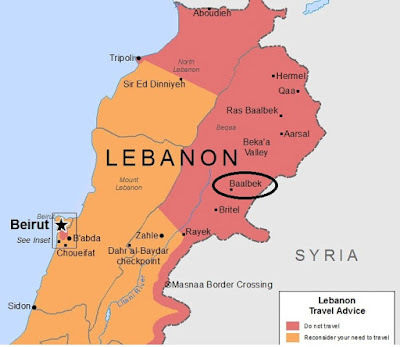 As we got closer to Baalbek the number of military checkpoints increased, as did the firepower, with anti-tank guns being positioned beside the road on the outskirts. Driving slowly into the town, the ruins revealed themselves, still dominating it by rising high above the houses and shops. There have been temples here since the time of Alexander the Great, when it was known as Heliopolis. 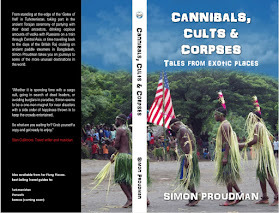 The Romans enlarged it and made it a place of worship to their Gods. They used such gigantic architecture that some have seen it as proof of alien visitation, being a landing pad for the alien spaceships. This is one of the only sites where the Roman architects seem to have decided they wanted to rival, if not exceed, the Egyptians at the Pyramids of Giza. The large cut blocks used for the foundations are so large that archaeologists still do not know how they managed to move them from the nearby quarry. They are too heavy to be lifted, even by most modern cranes. The Temple of Jupiter, of which only six of the original 54 columns are left standing, was the largest temple built by the Roman Empire. Each are 22 metres tall, and two metres in diameter. Eight of them were later dismantled and carted off to be used in the Hagia Sophia in Istanbul. You can spend an enjoyable day wandering around the site, the Temples of Jupiter and Bacchus dominate the centre of it, with the Temple of Venus close by. The Temple of Bacchus, larger just by itself than the Parthenon in Athens, is dedicated to the god of wine, and is also the best preserved. It has beautifully carved porticos and ceilings, some of which have fallen off and can be viewed close up, and a large mosaic of Bacchus himself on one wall, reclining while enjoying a glass of the local wine. Trust Bacchus, as the wines from the Bekaa valley, particularly the reds, are superb and at a very reasonable price. Get a bottle of Chateau Ksara or Chateau Musar Cabernet to taste at the end of your day of exploration, and you can understand why the Temple was built here. 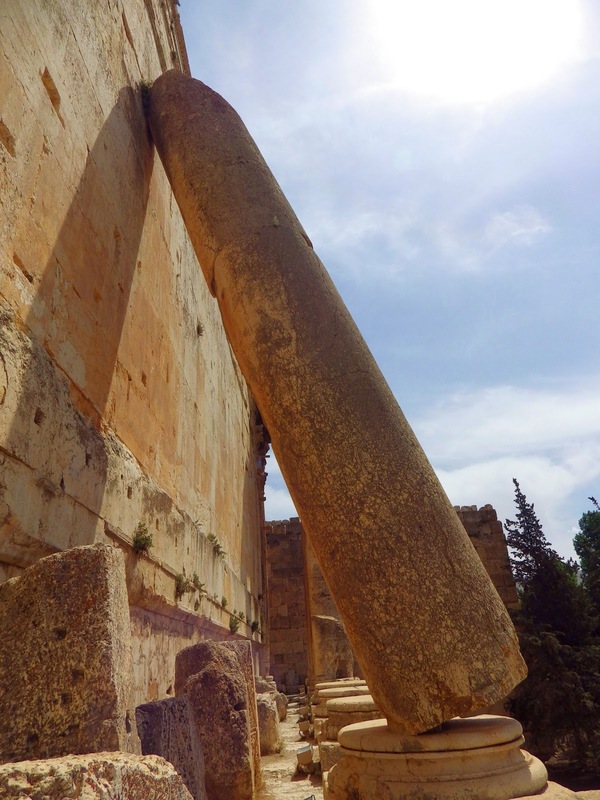 Despite earthquakes that have caused some damage, including pillars that have moved off their plinths and now lean into the temples, it still rivals the the historic sites in Rome and Pompeii, with its size making it unique in Roman archaeology. Hire a guide at the entrance, they look lonely and are little used currently. They deserve the small cost that will enhance your visit. As well as walking around the huge temples, leave time to walk under the site through the stables, not forgetting to look up and see the occasional Roman emperors face carved into the roof staring back at you, and spend time in the fascinating museum which houses many impressive statues and photographs of the excavations of the site, as well as detailed information on Baalbek's long history. To have the huge site to yourself as you explore is a rare opportunity in these times where mass tourism can often diminish the experience of visiting historical sites, although please do be aware of the risks of visiting Baalbek that this entails. Always check local conditions before you travel. Baalbek is two to three hours by car from Beirut. Local buses do depart from the Beirut Colo intersection in Beirut for 5,000 Lebanese Pounds (US$3) but only leave when full, and they can take a long time to reach Baalbek. For a day trip it is recommended to get a car and driver, this will cost around 150,000 Lebanese Pounds (100 US$), or go on a tour from Beirut. All tour companies offer daily trips, although there are minimum numbers required before they will run. 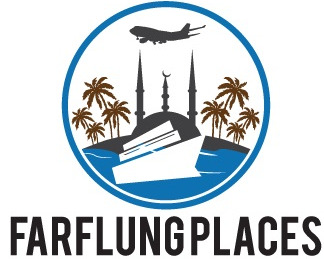 The entrance fee is 15,000 Lebanese Pounds (US$9) and the site is open from 8:00 AM to sunset.